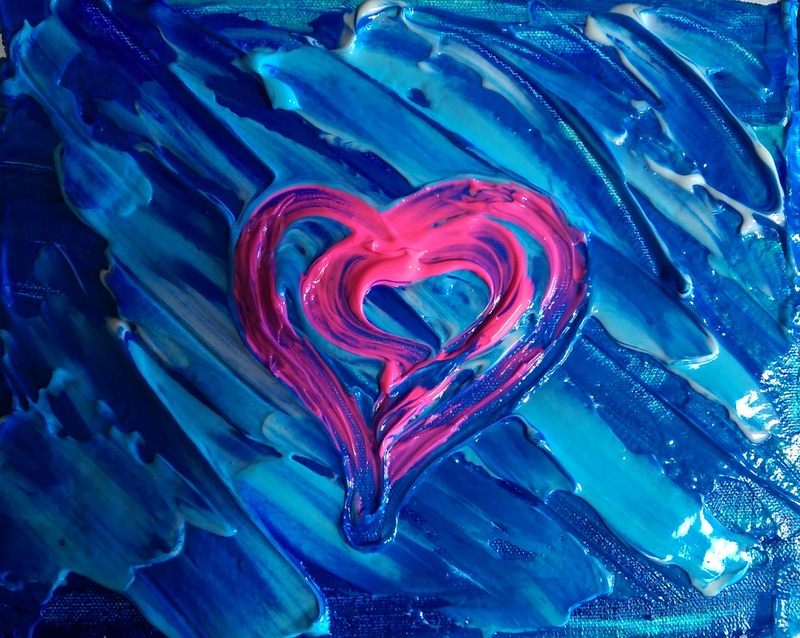 Yesterday, I painted “What About My Heart” for “Blue Shirt Day” a World Bullying Prevention day, showing solidarity and standing opposed to bullying. Please treat people well. When you see someone being treated badly, please make a point of objecting. It’s that easy. Here’s a relevant website, for resources. Today is World Bullying Prevention day. It’s ‘Blue Shirt Day’ for Stomp Out Bullying(.org). Bullying is no joke, and people are hurt by it’s callousness and brutality every day. If you see it, stop it; words are enough. Bullies function because people aren’t ‘calling foul’ on their bad acts. Today is a good day to make a point of calling it out when you see it, and saying it’s not okay. Today is a good day to set an example; be the change you wish to see in the world. Teach Wheaton’s Law – it’s a great starting point for treating others well. The Four Agreements, too, teach us all we could ever need to know about treating each other well. We have all the resources in the world to build a culture that discourages bullying. Please take time to do what you can, yourself, in your family and in your community, to send a message that bullying is not okay. If it can be said that ‘it stops being funny when someone gets hurt’, then I suggest it isn’t funny in the first place. Please help end bullying, every day. “Upon Closer Inspection” is an exploration of color and texture outside my usual materials. The vibrant green isn’t one I make a practice of working with, and having started out with it, I continued exploring the opportunity by also using new glow material. I had run out of phosphorescent acrylic paint, and the local art shop had none of quality in stock (many stores don’t consider glow in the dark to be a ‘professional use’ characteristic, and stocking it is a low priority). They had a sale bin, and in the sale bin were several craft kits for making glow-in-the-dark projects; they included packets of glow crystals. 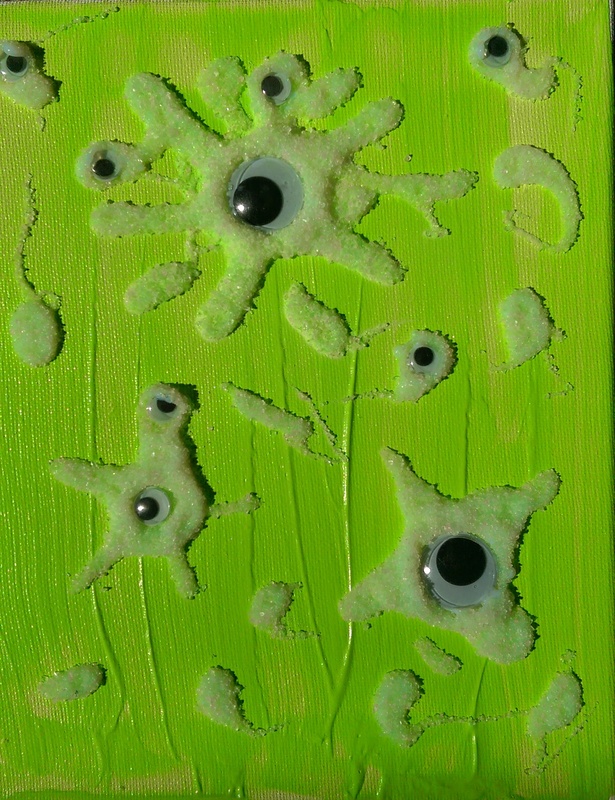 I used those, and clear medium with the googly eyes I had on hand to complete the piece, hoping to convey something about the idea that what we see up close isn’t always predicted by what we view from a distance… or perhaps something about life taking unexpected forms (or directions). It’s a small piece, at 8″ x 10″. This piece is available for purchase.